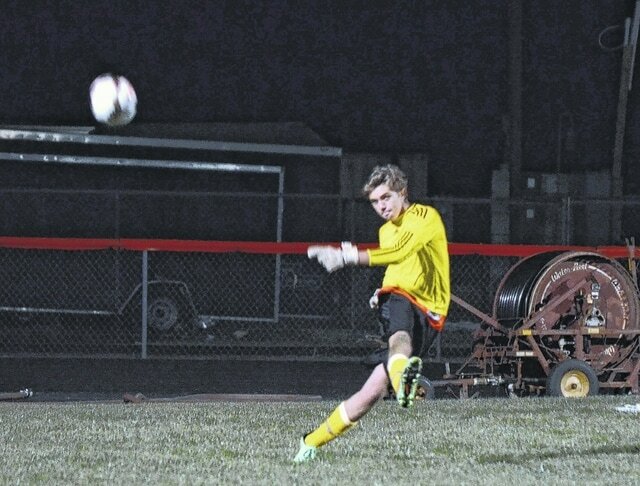 West Liberty-Salem’s Elias Kirker-Napierkowski clears the ball with a goal kick Tuesday night against Catholic Central. West Liberty-Salem clinched its second straight OHC girls soccer championship with a 3-1 win over Springfield Catholic Central on Tuesday. Goals for WL-S were scored by Annika Wolfe (2) and Lily Yoder. Yoder and Gabby Hollar each had assists. Paige Shafer had 1 save in goal for the Tigers (15-1, 9-1). WL-S defeated Mechanicsburg, 22-25, 25-21, 25-23, 25-19, in OHC volleyball. In the latest computer prep football playoff poll, Mechanicsburg (7-0) is rated third and WL-S (5-2) is fifth in Division VI, Region 22. The top eight teams in each region advance to the playoffs and the top four will host a first-round game. Graham’s 7th grade football team beat Ben Logan, 18-8. Standouts for GJHS (6-1) included Trace Braun, Jaesen Casey and Hunter Collier. The Urbana University men’s soccer team continues to make history. On Tuesday, the Blue Knights appeared at No. 18 on the latest National Soccer Coaches’ Association of America Top 25 Poll, moving up two spots from last week. It’s the highest national ranking for any NCAA team in school history. UU (9-1-1, 7-1 MEC), which is a winner of nine straight, remained in third place in the NSCAA Atlantic Region this week, where the top four teams qualify for the NCAA postseason. The Blue Knights currently sit atop the Mountain East Conference, which features three ranked teams including No. 5 Charleston and No. 25 Notre Dame College. The match of the year looms this week, as UU is set to square off against Charleston Thursday afternoon in Charleston, W.Va. Kickoff is set for 4 p.m. The Blue Knights hold a three-point lead over the Golden Eagles in the league standings, as the two schools meet for the second time this season. UC handed UU its only loss of the season on Sept. 8 by a score of 4-1.
https://www.urbanacitizen.com/wp-content/uploads/sites/36/2015/10/web1_KirkerNapierkowski.jpgWest Liberty-Salem’s Elias Kirker-Napierkowski clears the ball with a goal kick Tuesday night against Catholic Central.